Jun Saito – Office Jun Saito Co.,Ltd. Start playing piano at the age of 3, switch to drums at the age of 11. Study drums with Hideo Shiraki and Takeshi Inomata. 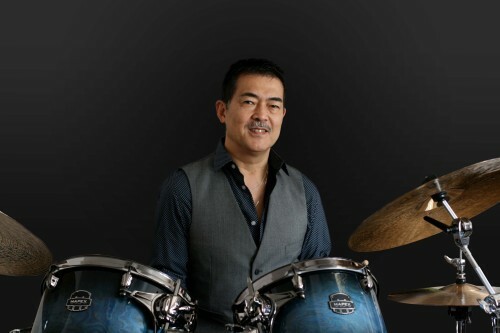 Join the fork singer Kiyoshi Hasegawa’s band as a professional drummer at the age of 17. Work with Shigeharu Mukai, Yoshio Otomo, Fumio Itabashi, Takehiro Honda, Hiro Oshima, Akira Omori, own band and many others. Appear and play on Warner Brothers Motion Picture “Brotherhood Yakuza” (starring Robert Mitchum and Ken Takakura). Enter Berklee College of Music in Boston. Study drums with Joe Hunt, Allan Dawson and Keith Copeland. Awarded the first Buddy Rich Scholarship. Swallow, Randy Roos, Stan Strickland, Phill Wilson, Kevin Eubanks and many others in Boston area. Perform at Newport Jazz Festival with Gary Burton Quartet, George Benson and Chick Corea. Teach at Berklee College Of Music temporarily. Start to teach at Berklee College Of Music officially. Move back to Tokyo. Work with Hideto Kanai, Keiichi Sjibata, Hiromasa Suzuki, Makoto Kuriya, Paul Jackson, Mickie Yoshino, Kazumi Watanabe, Naoko Ken, Etsuko Ichihara, Masaaki Hirao, Ryuzo Hayashi and many others. festivals in Japan. Start to work at Pan School Of Music as the chief instructor of percussion department. Start to teach at Friends Music in Tokyo, Japan. Start to teach at Shobi University in Saitama, Japan. Work with Larry Coryell, Michael Wolf, Melvin Sparks, Dan Ferman, Shunzo Ono and many others. Compose 100 year anniversary song for my old school “Bunkyo Kuritsu Hayashicho Elementary School”. Perform in concert at “Bunkyo Kuritsu Hayashicho Elementary School”. Move back to Tokyo. Work with Carol Yasmazaki, Makoto Kuriya, Ritsuko Endo, Kiyoko Ami, Hideko Shimzu, Shintaro Nakamura, Hiro Oshima, Hiroshi Kishimoto, Yoshio Otomo, Kazumi Watanabe, Nobuyuki Yanagisawa and many others. Release the first leader album “OLD THINGS, NEW THINGS”. (Recorded more than 30 CD and LP in Japan and US). Re release Mickie Yoshino’s album “PSM ALL STARS”. Perform in concert with own band for “LEXUS 10TH ANNIVERSARY”. Record and release the second album “BB’ 70s SONGS OF DEJA VU” with the Berklee alumni band “BB’ 70s”. Perform at the first “Yatsugatake Jazz Festival” with “BB’ 70s”. Record Jimmy C’s CD, “Rendezoous At Eight”, Naoko Sato’s CD, “What Is Love”. Perform at the first “SAKHALIN – HOKKAIDO JAZZ” with Kazumi Watanabe Trio. Yoshihiko Hosono, Nobuyuki Yanagisawa and many others. Record Betty Okshima’s CD, “Betty Sings Smile”, Rei Hamada’s CD, “16Tons”. Start to teach at “KUNITACHI MSIC ACADEMY”. Igarashi, Tosiyuki Sekine, Dennis Lambert and many others.